Would you consider your garden an oasis? Are you having fun in your garden this summer? I was at the gazebo yesterday, ready for my crafting activity but, I needed an inspiration for fun garden projects.Online browsing was all I did. I was actually looking for a garden activity idea that is unique and easy to make so; I checked The Gro Project on Facebook. 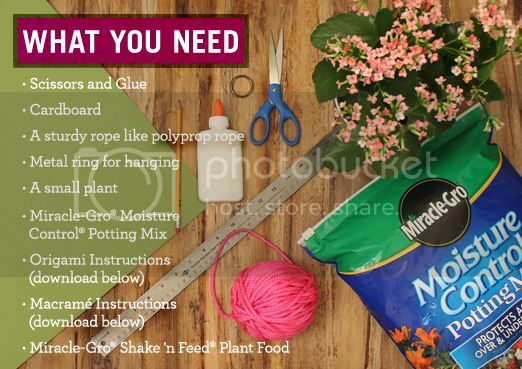 It took me a minute to find a great Gro Project from Miracle-Gro. I found the Origami Garden, simple and fun to make. The fact that the materials needed are available in my crafting kit so; doing the project is super easy. I had fun doing it so; would you like to try it too? Check out the materials needed to make an Origami Garden below: If you have all the materials so; lets make it now! Here are the 5 steps and I am sure, you and your family will enjoy doing this project. 1. 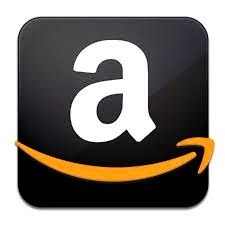 Use the Origami template (download it) to draw a polygon on a piece of cardboard, then cut it out. 2. Fold your cardboard according to instructions. Glue the overlapping pieces together. 3. While the glue is drying, use the macrame' template (download it) to knot your hanger. 4. Fill a lightweight pot with potting mix, then transfer your plant to it. 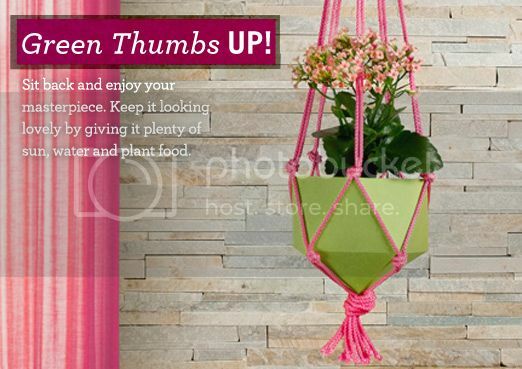 Water it and when it is completely dry, nestle it into the origami planter and hang. 5. Finally, sit back and enjoy your masterpiece! Keep it looking lovely by giving it plenty of sun, water and plant food such as the LiquaFeed All Purpose Plant Food Advance Starter Kit. How do you like it so far? Would you like to know more of the Gro Project ideas? Just check out the video below and you can also follow the Miracle Gro Online. For garden stories, ideas, tips and more, please follow the Miracle Gro Pinterest page. 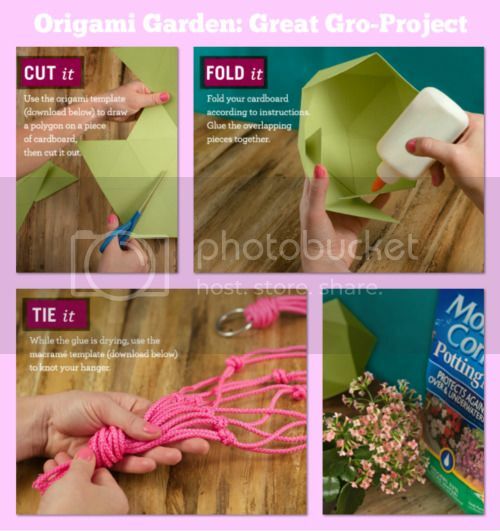 Gardening is fun when you are creative so; having the Origami garden project is an addition into your garden oasis. Have fun and enjoy your garden this summer! How pretty that looks!! I wish I was crafty--alas--I'm not--and no porch either---oh well. Oh I love crafty things - I'm also making jewelry and I love it. Great project, one that kids will enjoy as well. That is so neat and easy enough I could probably do it. I will definitely give it a try. This sounds like a great idea for someone who is in the mood for a garden project. I for one do not have a green thumb....or a green anything to keep anything alive, but good luck with your garden!